This was a left over from my all Sierra Nevada Thanksgiving Beer Dinner. It has been sitting in my beer fridge since Thanksgiving just waiting for me to review it. So lets get this show on the road. The beer pours a clear copper color with a dissipating off white head. The nose is delightful with caramel malt aromas with notes of fruit esters and floral hops. Ahh, what a nice Helles Bock! This beer has a very interesting earthiness to it along with a toasted almost smoky note as well. This experience starts out with sweet light malts up front followed by a very pleasant effervescence over the tongue in mid-sip. There is a slight robustness that builds toward the back-end. However this robustness is more like a rich earthiness and it is not overpowering at all. The back-end is fairly easy drinking with just a slight hesitation on the top of the swallow. From the rich earthiness of the malts the finish is clean with that nice toasted malt sweetness and just a hint of floral hops. The hops are just enough to dry the finish without bittering. There is a slight lingering toasted malt flavor on the final aftertaste. This really is an amazing bock. I really enjoy the rich earthy malt flavors in this beer. It almost reminds me of the German Alt beers. And the hops are not overly bitter more floral and sweet making a nice finish. I have to go for another high A on this. This beer is an amazingly crafted Helles Bock with a nice imperial aspect to it at 8.3 % ABV. 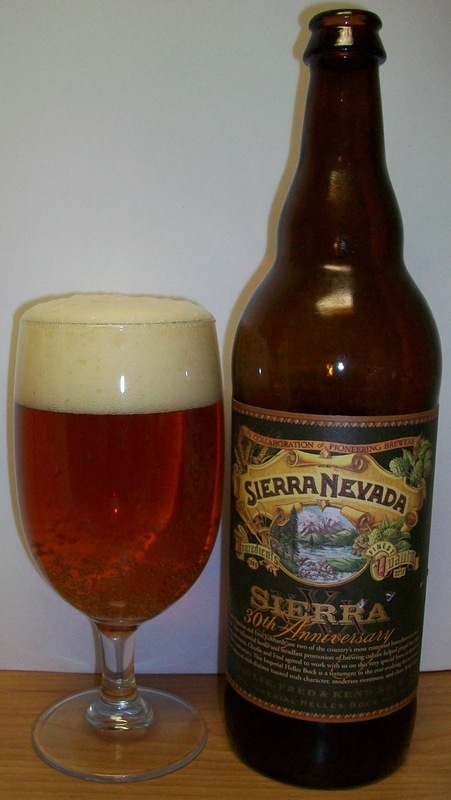 A very impressive beer as have all of the Sierra Nevada 30th anniversary beers been.